The practice of carrying Colours of Uniform design to identify each regiment and provide a rally point in the confusion of battle commenced in 1639. The Colours were carried in Battle in the centre of the front rank between the centre companies where they could be easily seen and recognised. This had a highly moral raising effect on the spirits of the troops. It also meant that the once battle parties were joined the Colour Party became an obvious target and the centre would see the most bitter fighting. Since 1751, regiments have been allowed two Colours only; the King or Queen’s Colour and the Regimental Colour. Although no longer carried into battle, Colours remain the symbol of the Regiment, for on them are born the battle honours granted in recognition of gallant deeds performed by its members. The Regimental Colours of the 39th Battalion rested for many years in Anglican Christ Church Cathedral in Ballarat, later to be placed in the Crypt of the Shrine of Remembrance in Melbourne, where they now remain in perpetuity. They bear the Battle Honours of the battalion in both World Wars. 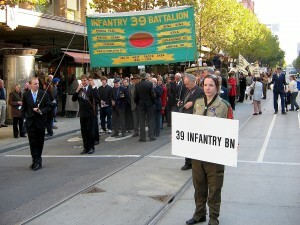 (Above) A 39th Battalion contingent with banners at an ANZAC Day parade.